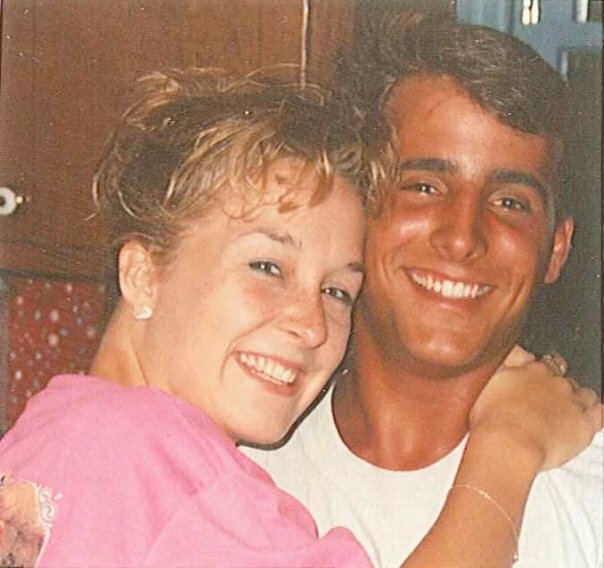 Circa 1994…not long before we were engaged. So happy then and still happy now. It’s been 18 years since I walked down the aisle — well, actually I tried to jog but my dad held me back– to marry Keith. It was one of the best days of my life, and a decision that I’ve never regretted. Oh, it hasn’t been a fairy tale. In fact, after six months of marriage, I realized that my life beared no resemblance to all those romantic movies I had seen. I was living real life, messy and complicated, full of bills and responsibilities, but I got to live it with my best friend. The early years were filled with close friends, late movies, spur-of-the-moment trips, and the comfort of coming home every day to the person you loved. Then the stretching came. My belly stretched with the expectancy of a new life, and at the same time our hearts stretched and broke with the death of my mother-in-law. A grandmother taken just a few months before she held her first grand baby. We left the comfort of friends and settled in another state. Life was painful for a while, but moved forward quickly, and we found ourselves with another sweet baby. One day blurred into another and soon we were raising our kids and helping to spiritually raise the kids at our church by becoming full-time children and student pastors. It was a season of life, I cherish. A season of growth – difficult at times – for both Keith and I, but we did it together. Now, I sit at my computer typing from somewhere in the jungles of Ecuador. We won’t spend our anniversary eating at our favorite restaurant, or going to the movies, or strolling the beach hand in hand. In fact, we won’t even spend our anniversary together this year. Keith is working a village an hour or so away building a church. But it doesn’t matter, because anniversaries aren’t about the celebrating the day you got married. It’s much more about the days in between: the days that you lose people you love, the days that you bring home a new baby, the days that you found out your checking account is overdrawn — again. It’s about the days that you don’t really like each other but fight to find a way back to love. Or the days when life is perfect and you share its tranquillity together. Anniversary days, and every day, are about the commitment to be hand in hand come what may. It’s a celebration of standing side by side for another year, whether beside a casket, a baby crib, a hospital bed, a sink of dirty dishes, or in the middle of the jungle. Keith, I’m thankful today for our togetherness. I’m praying for many more years and many more adventures. I guess if I followed you to the jungle, I’d follow you anywhere…as long as we can always be together. This entry was posted in Family Life, marriage on May 28, 2012 by aliciachall28.